My Divine Beloved! you were mine, you are mine, and you will remain mine forever. No longer will I be (with other spiritual philosophies or if anyone says otherwise). when my mind and intellect are drowned in your Love, the intellectual theories freeze. O, treasure of my life! Only you are mine, I surrender my body, mind and wealth to you. O, my Beloved! The pang of separation from you, will not deter my decision to love you and to find you. Give me such a deep pain of separation that the con-sciousness of my 'self' may dissolve in the feeling of your nearness. The glitter of gold also increases by putting it in a strong fire. O, Divine flute-player Krishn! whether or not you respond to my call, I will still continue to shed tears of love for you. My love for you will increase even if you increase my pain of separation by ignoring me. 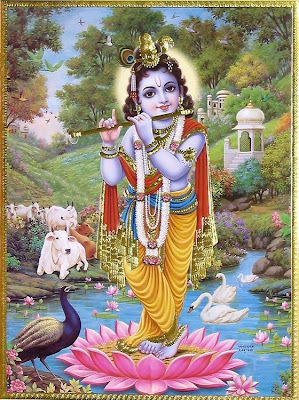 Beloved Krishn, I loved only you and I am begging for your love but I haven't brought the begging bag with me. Please hold me to your chest jut once and I will be thrilled with your kindness. either you hug me or kill me, Or give me your intense separation, I will still be singing your glory and virtues. one day my selfless love will effect your heart, and you will be longing to see me. You should know that I am sakhi of Radha Rani and I belong to Barsana. O Krishn! It is better if you take the defeat and don't resist, otherwise my loving frindship may be defamed. (people will say that a soul sacrificed has life upon you and you didn't come. How stubborn you are.) It's for sure that my love will win upon you as our history tells that you had to yield to your bhaktas. (In my case also) one day you may regret my being willful, so why don't you just come to me and get over with this struggle. you are my everything and my whole being is yours. In the world alo the increase when beloved is at home (not away from home). In your mayic creation of eighty-four lac kinds of species, I wandered uncountably involving myself in the deceptive illusions of this world. Now please accept me and call me to your abode. I am trying my best but I don't know how to please you. why are you quiet? Tell me something, and shower your Grace upon me. Don't delay too much that I may not endur your separation. My beloved! you are till quier. (you didn't nod.) It means that after all you have accepted me. I had faith in you (and now you have accepted me). It shows your promise of Gracing causelesly.